How can you tell, you might ask? Here are the ins & outs of lighting your kitchen correctly while remodeling. Let’s go over the 4 different kinds of artificial lighting and their functions first. Ambient Lighting also know as general lighting and it provides an area with overall illumination. General lighting is usually used as a starting point for the lighting process and gives the majority of light to the space. This allows for no shadows and should be located over the sinks and cook tops. Fixtures like traditional hung pendants, chandeliers, down lights, opaque wall sconces, and mounted fixtures are usually used to provide ambient lighting. Task Lighting or directional lighting is used by aiming the light source directly to a space to provide lighting to perform a task. This is especially important in the kitchen safety reasons, imagine chopping & dicing in a dimly lit space. Adjustable canned lights, a desk lamp, ceiling pendants, track lights, and appliance lights are all examples of task lighting. Accent Lighting focuses light on a particular area or object like art or a walkway. Sconces, floodlights, recessed lights, and tracking lighting are examples of accent lighting. These lights are also commonly used outside to illuminate your driveway or garden. Highlight your beautiful heirloom china or the architectural beauty of your home with this form of lighting. Decorative Lighting -the architectural bling as some call it, is the 4th layer of interior illumination. Chandeliers, pendants and sconces are examples of this lighting. This lighting can serve other purposes also while becoming accessories to ensure your home looks it’s best. It’s like the jewelry of the home, the sparkle & shine! This is where your character and style comes to play, so have fun choosing that signature piece. Now that we got that out of the way, let’s discuss the next step, your design. Is your kitchen an open floor plan? If so consider lighting that compliments the entire home. Even though the kitchen will be used for a different function in the home, the design & decor should flow seamlessly throughout the home. No need to match perfectly but instead complimentary for sure. All great kitchens begin with layered lighting. This can be achieved by using distinguishing light fixtures, setting the different spaces of the kitchen apart. Use dimmers on every light possible and make sure each type of light has it’s own dimmer. This gives you total control of your lighting to set the mood and more importantly saves you money all year long. Let us move onto over the cabinetry lighting. 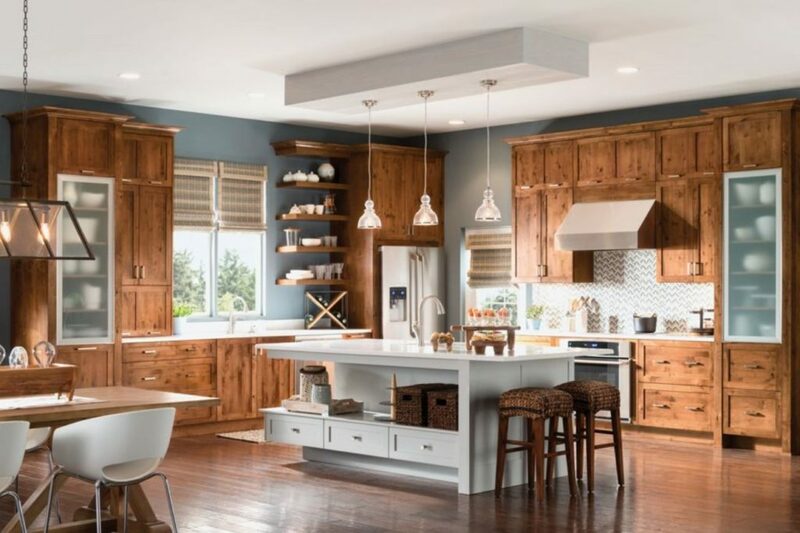 If you choose not to go all the way to the ceiling with your cabinetry and have at least 12 inches of space above the cabinets, you can illuminate the ceiling with this lighting, which will reflect down, creating and ambient glow in your kitchen. While under the cabinet lighting will illuminate that dark drawer you can’t find anything in. Find those sharp knives and use those kitchen appliances safely with this task lighting. But let’s not forget it also highlights that beautiful stone counter top you’re so proud of. Puck, strip and mini-track lights are usually used but lately it is more common for LED’s to be used for this purpose. Glass front cabinets or open shelves in the kitchen are where you should consider inside cabinetry lighting. This lighting will bring visual interest and depth to your fine china and pottery. Think museum, Accent lighting is great for bringing that canvas or family photos to life. so why not make a statement with decorative lighting. a chandelier measured properly will give your Island a luxurious finish. Lastly, toe-kick lighting has become popular with home-owners. This ambient light is a great way to illuminate your floors where the cabinets meet them to ensure you don’t stub those toes while heading to the kitchen for that midnight snack. These nightlights are inexpensive and are usually LED strip lights or rope lights that are ran underneath the cabinet above the toe-kick. Choose one that has a dimmer or remote or even a motion sensor activated one for optimal use. So remember to layer lighting, use dimmers on everything, choose proper lighting fixtures and light bulbs, and don’t be afraid to think out the box when comes to lighting like using a chandelier over a reading nook!